Heat the rice at the bottom of the jar. Heat 1 teaspoon of olive oil in a saucepan over medium heat. Cook the peppers for 4-5 minutes while stirring them. Add the salt and pepper and add to the jar over the rice. Heat another teaspoon of olive oil and cook the garlic, onion and mushroom for 4-5 minutes. Add salt and pepper, and then add to the jar. 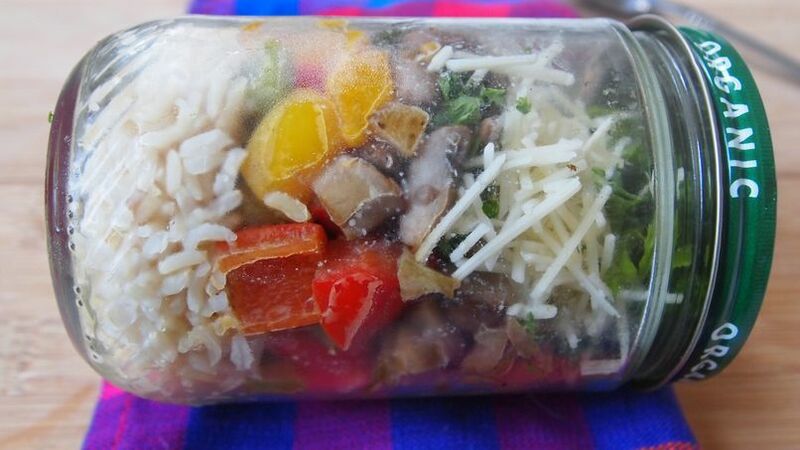 Cover with the herbs and shredded cheese, and then cover the jar. Your lunch is ready to take to work. Before reheating it, just mix everything well in a plate. If you have time, it's best to let the vegetables cool before putting them in the jar. This way, the pilaf will remain fresh for longer. If you want to eat it immediately, just prepare the recipe without the jar. Don't forget to heat the rice before mixing with the vegetable. Those of us who cook regularly know that sometimes we end up making too much food. This is not always a bad thing, sometimes we do it on purpose to enjoy leftovers the next day. If you cook just for yourself, this doesn't need to be a problem. There are very few one-person recipes in books, magazines and websites. Most recipes are created with 2, 4 or more people in mind. However, adapting them to individual portions is easy, just divide the quantity of each ingredient. If this is a little too complicated, don't worry. You can fill preserve jars to have individual portions ready in the refrigerator. Keeping food put away like this makes it easy to transport, making it the perfect lunchbox for work.